From a floating hair bug to bottom-bouncing jig and two flies for in-between, legendary flyfisherman and innovative fly tyer Dave Whitlock teaches you how to tie four of his favorites. He also discusses the most effective use of these flies. The four flies are the Most Whit Hair Bug, Dave's Swimming Frog, Dave's Sheep Shad and Dave's Hare Jig. In this video Dave discusses the history of the Red Fox Squirrel Hair Nymph and how to tie the four variations pictured on the video box. He also gives on the water inistructions on how to cast and present the Red Fox Squirrel Hair Nymphs, and where fish are most likely to feed on them. In this hour-long video Dave Whiitlock discusses the history, the materials needed, and how to tie Dave's Hopper and the Whit Hopper. He also provides on the water instructions for how to cast, present, and fish them. In this vedio Dave shows you how to tie one of his most successful and popular flies - the Matuka Sculpin. The tape begins with why and how Dave originated the fly. He then provides an in depth discussion of his choice of materials, followed by step by step instructions for tying it. Lastly, Dave gives the viewer on the water instructions on how to cast and present the fly. In this excellent instructional video you will learn how to evaluate deer hair and select the proper tools for spinning, packing and trimming it. Of course, you will also learn how to spin, stack, add colors, and trim deer hair on the hair bugs that you tie. Lastly, Chris shows you how he installs rubber legs and eyes. You can order this video directly from Chris Helm by calling him at (800)579-5549. This is a "must have" video for every fly fisherman who likes to fish for the "Golden Ghost." Brad takes the viewer step-by-step- through the tying sequence for some of his original, most effective carp flies. You also will learn tying and material handling techniques as well as the proper hook and material selection to build the Creep-N-Craw Crayfish, the CDC Cottonwoood Seed, the Emerge-It, the Rubber Legged Swimming Nymph, Carp Candy, and the Wiggle Bug. 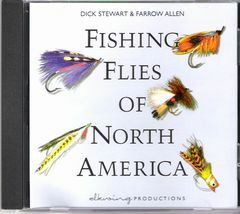 This is a CD that includes all of the flies and their recipes in the five book series that included Flies for Bass and Panfish, Flies for Trout, Flies for Atlantic Salmon, Flies for Steelhead, and Flies for Saltwater.